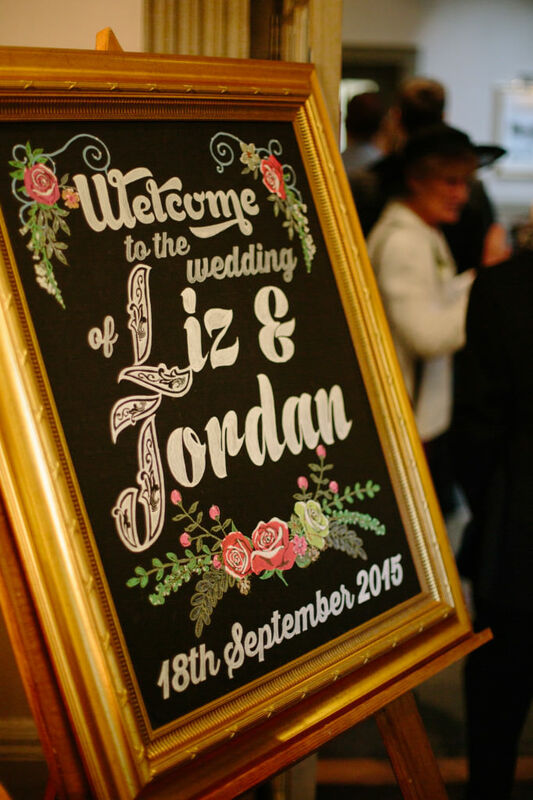 We take a look at the finer touches that made Liz and Jordan’s Wedding at The Mansion just perfect. 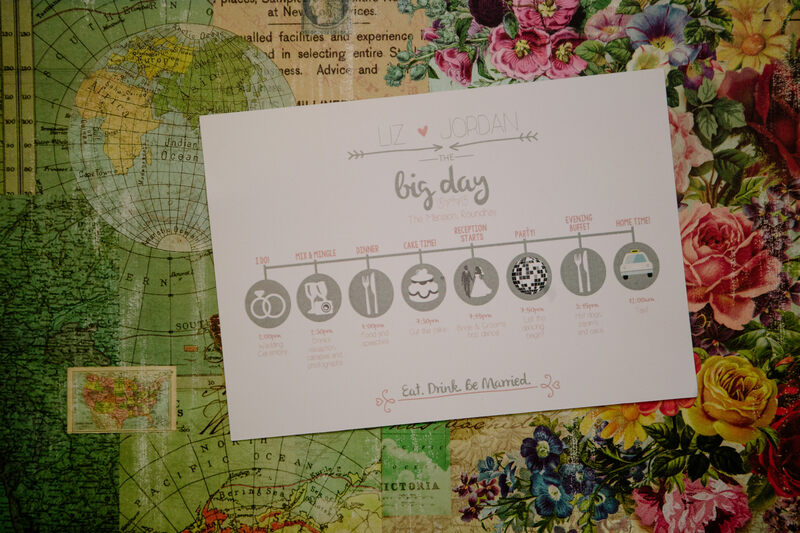 Where and when did you get engaged? Tell us what happened? Ever since we’d moved to Roundhay, we’ve always had a soft spot for Roundhay Park and we’ve been there for several weekend walks on our own/with family and had picnics there as a couple. Jordan had been talking about having a picnic in the park for weeks in the summer of 2014 but for one reason or another we’d not made it and so we decided to have an indoor picnic (it was raining) complete with candles and music, August bank holiday weekend. We were going to New York at the end of September and to be honest, my friends and I had speculated that Jordan would propose while we were away. I was in complete shock when he got down on one knee and asked me to be his wife! I later found out he’d been planning it this way for months and had even spent an evening with my dad to ask his permission. 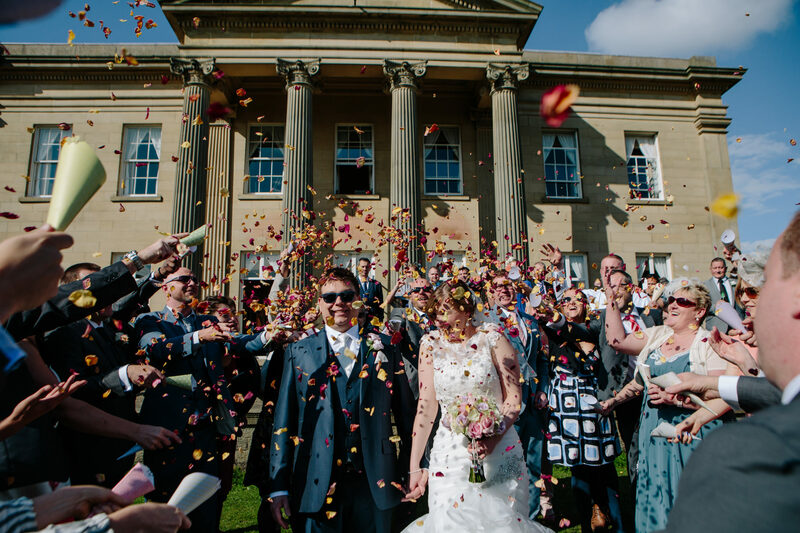 It was a perfect proposal and meant so much because we were in Roundhay and we were having a picnic like we’d done on so many occasions in the park. One of our first picnics in the park was near the top by The Mansion. Over sausage rolls and wine, we noticed a newlywed couple coming out of the venue and we both thought it would be a beautiful place to get married. When it came to looking at venues it was at the top of our list and I think I’d pretty much made my mind up before we’d even arrived! 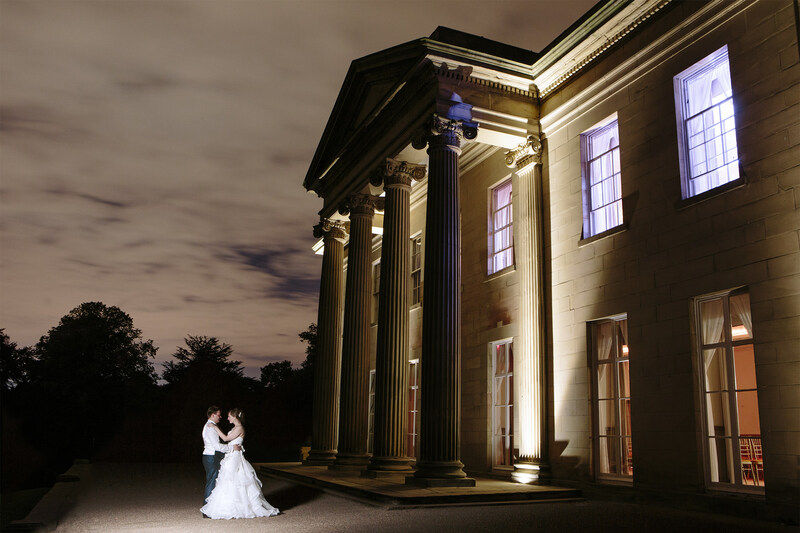 The venue is gorgeous and we both had a good feeling about it as soon as we entered and felt that it was very ‘us’. Seeing the rest of the venue and speaking to Matt firmed up the decision and we both walked away clear that we’d found the venue where we were going to get married. We didn’t need to see anywhere else and confirmed within a couple of days. Did you have a theme/ style for your wedding? Why did you pick this theme/ style? Our main priority for our guests was that everyone felt comfortable, not too formal, and had a great time. 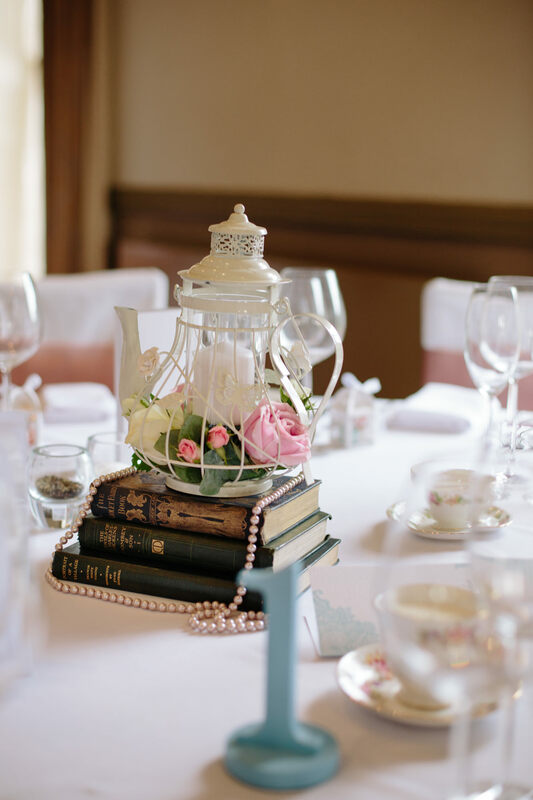 We felt a vintage theme with pastel colours would promote a relaxed feel with everyone on the day. What sort of dress/outfit did you choose and where from? Why did you choose it? 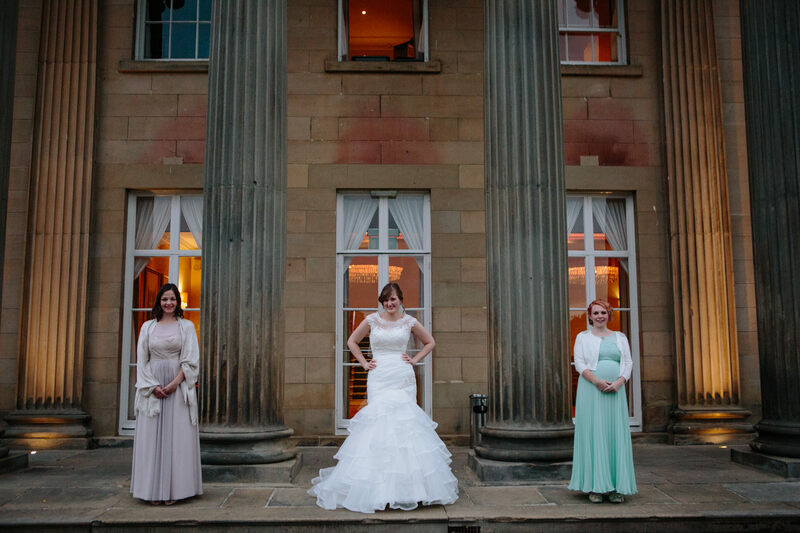 I chose the ivory Cheyenne mermaid wedding dress by Maggie Sottero from Abigails Boutique in Leeds. I added a Justin Alexander beaded lace jacket which was to be taken off for the evening do and replaced with a chunky necklace and beaded belt. I’m very indecisive and I trust Jord’s judgement and opinion explicitly so to go shopping without him for the most important outfit of my life was very daunting. 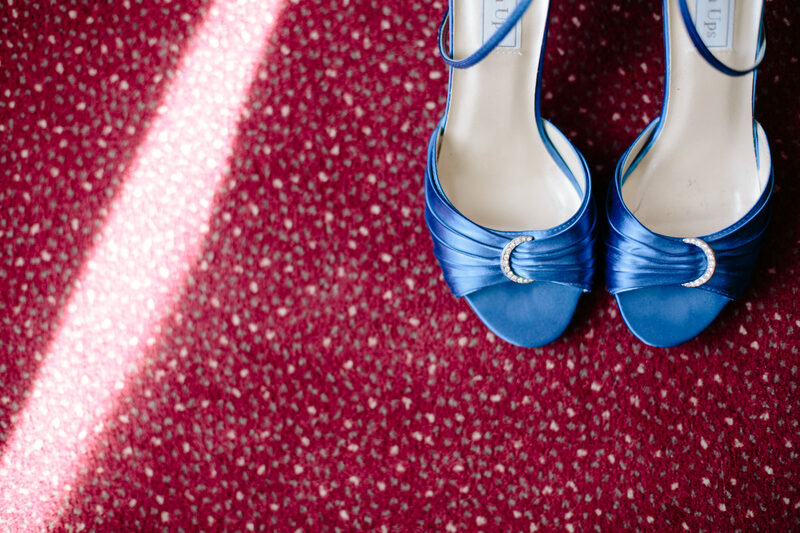 It didn’t help that I was already very nervous about trying on wedding dresses – I suppose it made getting married seem more real. It was a very surreal experience and the dress I eventually chose was the only one that got full marks from my mum, bridesmaid and friends that came with me. I’d decided I wanted electric blue shoes (which was my something blue) a few months before but I couldn’t find anything suitable anywhere. I ended up driving to Liverpool and getting an ivory pair specially dyed. I was a little worried they wouldn’t turn out how I wanted but they are fantastic and everyone loved that I’d added a bit of cheeky colour to my ivory outfit. 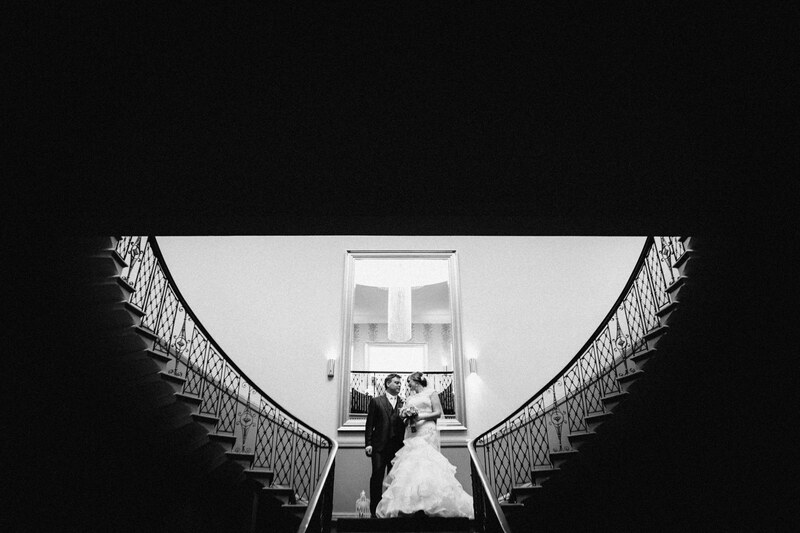 Who was your photographer on the day? Would you recommend them? Why? Our photographer was Mark Newton and he was amazing. 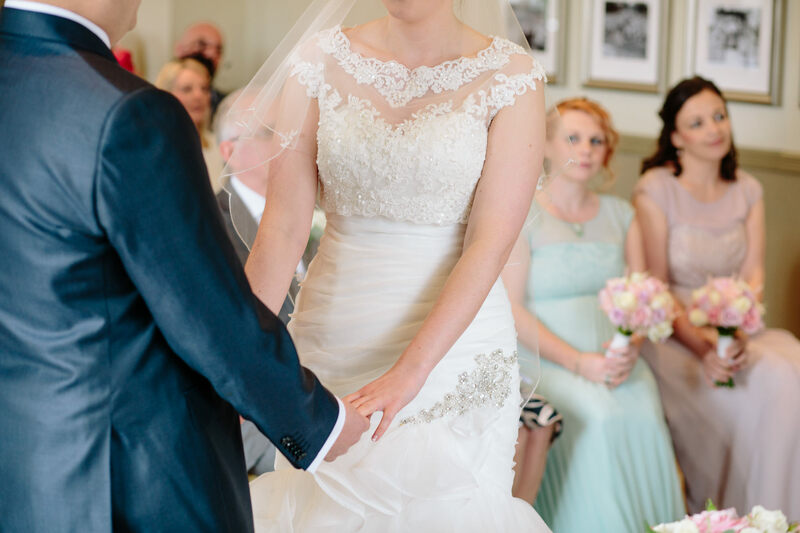 We met him at a wedding fayre at The Mansion and from the moment we met him we both felt comfortable with him, he was very natural and relaxed and this came through in the pictures we saw. His documentary style is exactly what we wanted for the day – action shots, not staged shots. We had an engagement shoot with him and he made us feel very at ease throughout the day and on the actual wedding day he was fantastic. He was everywhere but not at all intrusive and he had a laugh with the guests as well and he even got in on a photo booth photo or two with the bride and groom! What flowers did you carry if any? Who provided them? 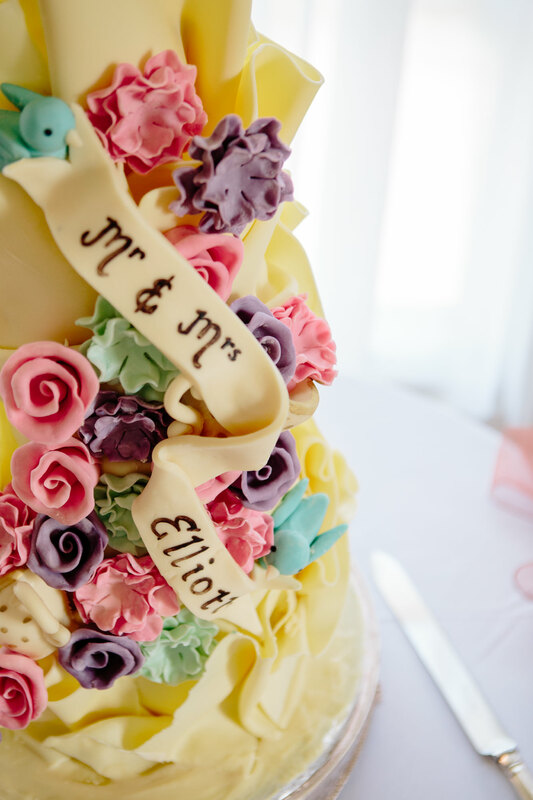 I carried a mix of pastel coloured roses which people remarked looked like sweets which is perfect as I have a very sweet tooth! 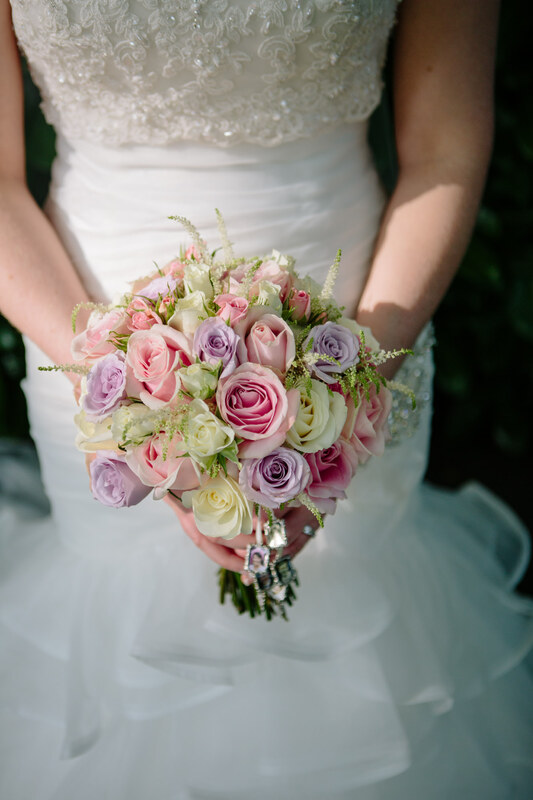 We chose Louise from Petals by Louise. She was brilliant. I have to admit, I have no idea when it comes to flowers but I knew I liked pastel colours and roses and what she created was beautiful. She’d placed extra flowers in and around the decorations at the venue which just added to what we’d already done. She did a fantastic job and my mum dried all the petals while we were on honeymoon so I can keep my bouquet forever. What “special touches” did you add to your day? Being quite crafty, I knew I was going to make a few of the decorations myself – I think it was almost expected by people who know us. Whenever I’d been to a wedding, I always thought about my own relationship and I wanted people to remember their wedding day on ours so we managed to get pics of our guests on their wedding day and put these around the venue in frames. As an engagement present, I’d received a lovely picnic basket from the girls so this was used as our card box. Would you recommend Dine to another couple? Why? Yes definitely. The food was delicious and the people at Dine were fantastic on the day. We can’t praise Craig and his team enough for everything they did, it was perfect and we didn’t have to worry about a thing. We had so many good comments about the food, drink and the staff and it was great to hear that we’d made the right decision. What did your Dine Event Manager do to make your day extra special? 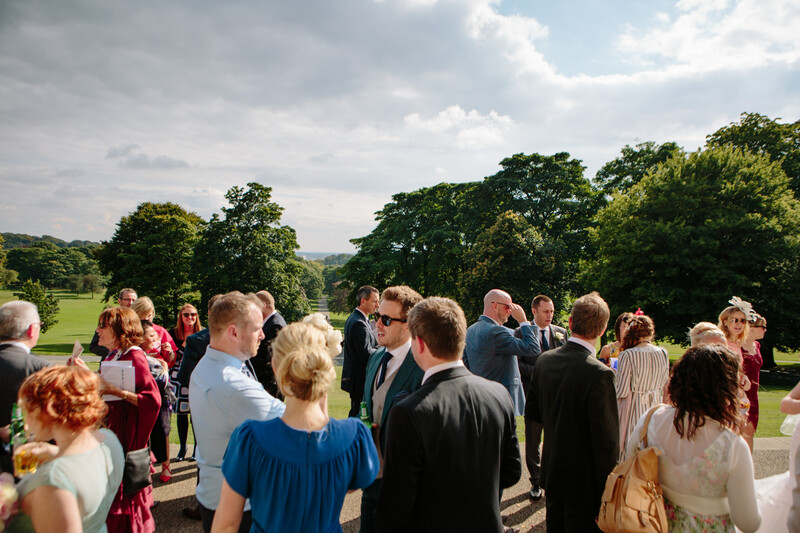 Before the wedding I had loads of last minute questions – would there be a microphone for the speeches? Did the gluten, veggie people need a mark on their place name cards so the servers knew who they were? Can we set up decorations the day before the wedding? etc. You are in very safe hands and I can’t wait to deliver your perfect day. Do me a favour though, on the day just take off your watch, enjoy it and let me do the rest. That’s why you chose Dine for your wedding. I’m more than excited enough for both of you! This made me stop for a second and reminded me that this is what Craig and his team do every day and to just trust him. As soon as my dad and I turned up on the day, it was obvious that Craig had it all in hand and was in control of everything. What was your favourite part of the day? Why? I’d mentioned to Jord very early on that as well as speaking to our guests and mingling it was really important to me that we spent a few minutes together after we’d got married to reflect on the day. After the cake cutting and the first dance, Jordan grabbed my hand and took me outside The Mansion and we sat under the columns on the terrace. One of the staff brought out a bottle of Fizz, two glasses and some chocolates and we sat, under the stars, with the reception music in the background talking about how amazing the day had been. It was even better than the two minutes I thought we’d get to take it all in. We had a bit of a dance when Michael Jackson came on and Mark set up his camera to take a pic of us in the moonlight with the venue in the background. After that we went back to the reception and danced the rest of the night away. Our top tip would be to have a few quiet moments together at some point through the day so you can reflect and take in what’s happening. 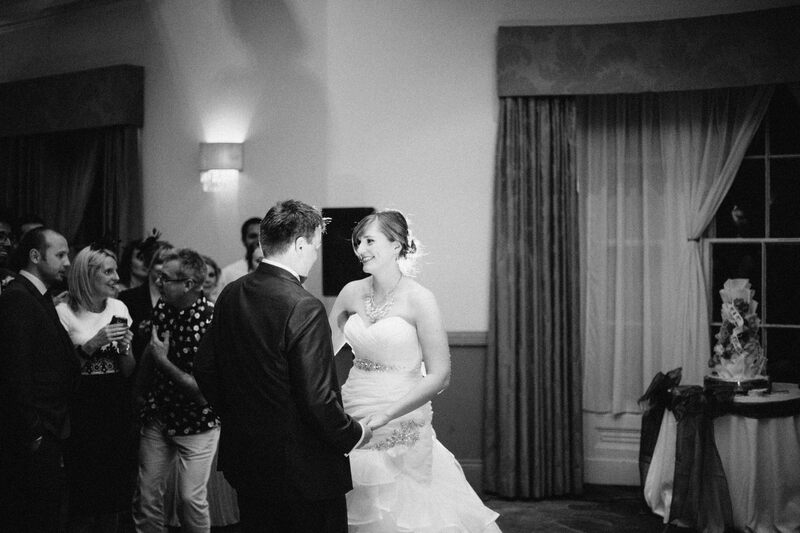 Apart from marrying my best friend, dancing to Billie Jean outside the venue was my favourite part of the day and I’ll treasure those moments forever.